For example, when was the last time did you see a job description that never talked about work ethic? It doesn’t end there. In addition to helping someone secure a job, it can also help the employee maintain it even when a firm carries out the likes of a retrenchment. Equally important, it also plays a huge role when it comes to promoting and demoting workers. That shows how important the virtue is when it comes to all careers. Nevertheless, what is a good work ethic exactly? What can one do to have that? 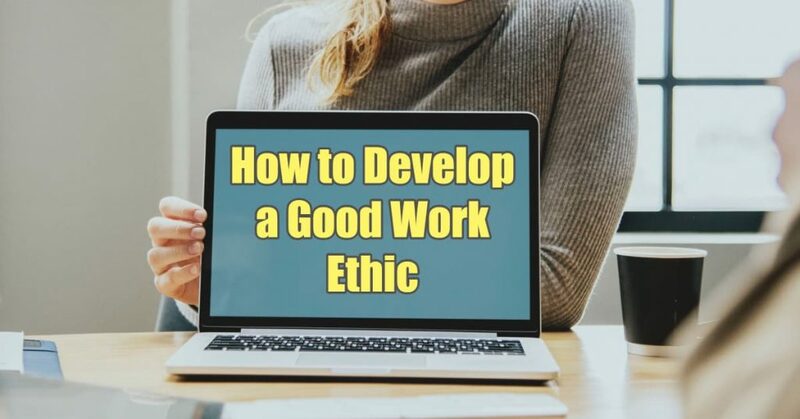 Read on as we answer all that including a guide on how to develop a good work ethic. Whether it is a behaviour that one should follow or a characteristic that people possess are what we aim to answer in this segment. The list of the definition of work ethic is endless. However, we can express it as a combination of your attitude as well as behaviour when it comes to your career or job. That would also include the way you interact with your colleagues. How do you treat them? When it comes to interactions, how would you rate it? The answers to such questions can help you assess your work ethic and know where to improve. Accountability, humility, integrity, and honesty are some of the elements of a good work ethic. Let us take a look at the attributes in detail. People with good work ethic will always fulfil their duties and responsibilities. He or she will not do the tasks for the sake of it. They will aim to do their best and also deliver the best results. Imagine a situation where every employee did the right thing at the right time. Honesty makes that happen without the need for supervision. That is a characteristic of a good work ethic. It is one factor that influences the productivity of any employee. That’s because it plays a huge role when it comes to determination, dedication, and focus. If that were to be in place, everyone would always play his or her position accordingly. Organizations can only do well with great teamwork. After all, every employee is just but a player striving to reach the goals of the firm. With a good work ethic, that will be possible. Equally important, it promotes good communication that makes the working environment conducive. That alone shows everyone how committed you are when it comes to your job. In addition to that, you should avoid missing work unless under unavoidable circumstances. However, weather and daily traffic should not be termed as such. It is not all about arriving at work on time. Once there, ensure that you use every second wisely. That way, you will avoid doing your job at the last minute. You will also have time to go through your work to ensure that you give nothing short of the best. Managing your time well will also ensure that you observe deadlines without stressing yourself by rushing during the last minute. One can even manage time well by avoiding procrastination. Given the standard behaviour of a professional, being one is an excellent way of how to develop a good work ethic. It ensures that you dress decently and appropriately. It also determines how you will treat clients as well as colleagues. Professionals are usually respectful, which is something that every party working in a firm appreciates. Professionalism also affects your productivity. You can’t afford the time to gossip, and you will always be happy and confident. It is the only way that people can rely on you and won’t get disappointed, eventually. In addition to complete tasks assigned to you, you will also do that on or before time. In case you can’t deliver, don’t put someone’s hopes up to crash them later. If you do that, you will develop a good work ethic. Knowing where you are and where you want to be in the future can help with the development of a good work ethic. That alone is a great inspiration that can increase your productivity. You may not be anyway near now, but if you strive to be better each day, you can rest assured that things will keep improving. However, only set goals that are achievable to avoid disappointments that could affect your work altogether. The world is full of distractions, no doubt. With this era, the most common one is social media. Ensure that you avoid checking your Facebook now and then. Otherwise, your concentration will be low, and that might make your work since you are not giving it the time it deserves. It is also unhealthy to keep checking your email every second. Too much of everything is poisonous, and work is no exception. Therefore, as you work to ensure that you don’t overdo it. That’s because it will be overwhelming within no time and that won’t do your work any good. Ensure that you relax enough and also get quality sleep. That’s because health can affect how you think. Consequently, that will not only determine how you make decisions but also the judgment that you make. When it comes to attendance, being healthy will avoid absenteeism. That’s why you should develop a routine of eating healthy and balanced food. Equally important, you should exercise regularly. If you do so, you will be not only fit but also healthy. Since you are an employee of a company, working alone may not be enough since it is the results that will matter. That’s why you need to cooperate with others. To develop a good work ethic, you have to learn how to set aside your differences with colleagues for the sake of the company. You will also need to separate work and personal issues. Consequently, relationships will improve and that will boost teamwork. Last but not least, observe all the rules. It starts with the basic ones because it may be hard to keep the big ones if you can’t obey the simple ones. The dress code, as well as the company policies, should be followed at any cost. It is surprising how simple it is to develop a good work ethic. It is all about having all the critical elements of a good work ethic. In addition to that, you should follow the guide above, which discusses how to develop a good work ethic. Once you do that, you can rest assured that success will be part of your story and your career path will be amazing.